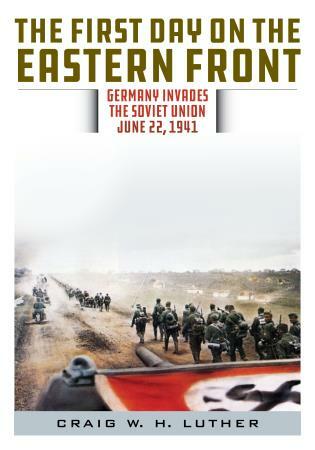 Sunday, June 22, 1941: three million German soldiers invaded the Soviet Union as part of Hitler’s long-planned Operation Barbarossa, which aimed to destroy the Soviet Union, secure its land as lebensraum for the Third Reich, and enslave its Slavic population. From launching points in newly acquired Poland, in three prongs—North, Central, South—German forces stormed western Russia, virtually from the Baltic to the Black Sea. By late fall, the invasion had foundered against Russian weather, terrain, and resistance, and by December, it had failed at the gates of Moscow, but early on, as the Germans sliced through Russian territory and soldiers with impunity, capturing hundreds of thousands, it seemed as though Russia would fall. In the spirit of Martin Middlebrook’s classic First Day on the Somme, Craig Luther narrates the events of June 22, 1941, a day when German military might was at its peak and seemed as though it would easily conquer the Soviet Union, a day the common soldiers would remember for its tension and the frogs bellowing in the Polish marshlands. It was a day when the German blitzkrieg decimated Soviet command and control within hours and seemed like nothing would stop it from taking Moscow. Luther narrates June 22—one of the pivotal days of World War II—from high command down to the tanks and soldiers at the sharp end, covering strategy as well as tactics and the vivid personal stories of the men who crossed the border into the Soviet Union that fateful day, which is the Eastern Front in microcosm, representing the years of industrial-scale warfare that followed and the unremitting hostility of Germans and Soviets. Craig Luther is a former Fulbright Scholar and is a recently retired U.S. Air Force historian. He is author of Blood and Honor: A History of the 12th SS Panzer Division and Barbarossa Unleashed: The German Blitzkrieg through Central Russia to the Gates of Moscow. He lives near Bakersfield, California.